When the Common Prayer Book is affirmed as a standard for Anglican faith, it is usually understood as including the short catechism, divine offices, sacraments, and preface. But, often passed over is the lectionary. The lectionary, especially when coupled with the collects and readings) is perhaps the richest fount for Anglican doctrine as it provides the verses by which we are to understand or unlock scripture. In otherwords, the lectionary is a hermeneutical compass unlike any other, and it is often overlooked. However, with every prayer book revision, the lectionary has also been modified, yet rare are the studies on successive lectionaries as an evaluation would require consideration of an enormous volume of material. The reintroduction of the ecclesiastical year (even with most readings organized in an expository framework) especially makes this project formidable. That said, the problem is significantly reduced if the lectionary of various BCP’s are considered for those Holy Days historically found in the ‘Table of Feasts’. That leaves a sample of about thirty readings each taken one-by-one. My hope is to cover these thirty festivals over a casual course of three years, starting with Ascension Day as the first of many micro-studies which, once added together, can perhaps evaluate the good behind our several lectionary revisions, especially what the 1928 BCP contributed. 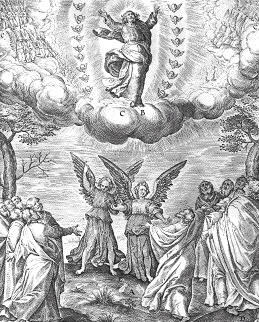 Ascension Day: Morning and Evening prayer selections experienced no great change between the 1549 and 1662 lectionaries other than the omission of John 14. In 1662, J14 appears to have been replaced by the more historical gospel, Lk 24. However, the theme remained the same, namely, “I go away, and come unto you” (v.28). The gospel and epistle readings for the communion, as with the collect, also remain the same, Acts 1 & Mark 16. The latter illuminate in what sense Christ returns to the apostles left in Jerusalem, and this is by the Holy Spirit, imparting many gifts and signs of ministry (Mk 16:16-17). Thus, a dual message is conveyed: First, Christ’s ascension or leaving of the apostles to therefore be crowned/enthroned in heaven. Second, Christ’s return by means of the Spirit which culminates by judging of the world. Hence, two advents are described. The first-Advent coming to a conclusion with the ascension, but followed closely with the second-Advent that starts with the investment of the Holy Ghost at Jerusalem. Ascension roughly marks a transition in the calendar between two major themes or basic seasons, namely, between the mission of earthly Christ-incarnate, designated from Christmas to Ascension, compared to the Reign of heavenly Christ-glorified, celebrated between Pentecost to All Saints. NT Wright rightly recognizes the redundancy of such Roman Catholic festivals like Christ the King, especially at the fore of Advent, or the Methodist ‘kingdomtide’ introduced to reduce the extraordinary length of Trinity season. If there is a Kingdomtide (which there is not), it seems Pentecost to All Saints would best fit the description. As it is the ascension theme of “taken up, and sending down” is a portal between seasons, and it might be added the ascension collect belongs to the kingdom’s “rapture” said in the Sursum Corda. Anyway, getting back to the BCP lectionary, we have no major change to it until the American. Even here the American makes no alterations until 1928. The 1789 and 1892 BCP’s both carry forward the older EP/MP selections for psalms, old testament, and new testament reading. Ditto with the communion reading. But the 1928 cuts out 2 Ki 2:1-16 and, very curiously, Mark 16. Also removed by the 1928 American revision are three psalms: Ps. 8, 15, 21, 108. These are replaced with Ps. 93, 96, and 99. Also, added was Is. 33:5-7, 20-22 and, strangely, verses 39-37 from the KJV Apocryphra’s Song of Three Children. Omitted Parts: What did the 1928 American revision thus accomplish with its Ascension readings? The upside was more controversial verses were replaced with what might be considered safe scripture. The older readings made use of rather elusive passages regarding the crowning of the son. In some respects these passages from the book of David were unclear if man or Christ was spoken. Speaking of man’s creation, psalm 8 then says “Thou madest him to have dominion of the works of thy hands; and thou hast put all things in subjection under his feet” (v.6). Likewise, the twenty-first says, “for thou shalt meet him with the blessings of goodness, and shalt set a crown of pure gold upon his head” (v.3). However, given their relation to Ascension, the calendar makes it clear these passages are speaking of the Father crowning the Son and sitting Himself upon the right-side of God, “Set-up thyself, O God, above the heavens” (Ps.108:5). It might also be noted that following these general descriptions of heavenly crowning, the psalter selections usually proceed to describe the resulting rule and judgement of the Lord. However, Daniel 7 remains for the matins reading, so an apocalyptic references remains albeit not as frequent as with the 1892 and earlier. The last interesting point is perhaps a concern over charismatic gifts as suggested in Mark 16 and 2 Ki 2. While Mark talks about snakes, healings, and exorcisms, 2Ki describes Elisha receiving the spirit of Elijah who thence exorcises water with salt, “I have healed these waters; there shall not be from thence any more death or barren land” (v.21). While more likely 2 Ki2 was omitted due to Elijah’s “taking up”, it’s unfortunate the readings dealing with signs were omitted because they tell us how Christ returns, namely, by the gifts imparted by His Spirit. Mark 16 could also be read in context of Acts 1, “that you will baptize by the Spirit”, with the signs of healings, casting of demons, and treading of snakes being the inner workings of holy baptism. Furthermore, 2 Ki gives us a picture of Christ leaving the apostles by the rapture of Elijah leaving Elisha. However, Elijah leaves behind his mantle as a sign by which Elisha continuous the prophet’s miracles. These miracles curiously are the parting of the Jordan, much like the Red Sea, and the exorcising of water to impart life; thereby we too can “ascend”. In light of Mark 16 and Lk 24 these are pretty obvious allusions to new testament baptism. Conclusion: While the 1928 offers ‘safe’ readings, the role a second advent plays seems diminished by select doxologies which often do little more than praise powers of creation. Lost also is the benefit that a lectionary normally bares by providing relevant cross-references to illuminate scripture’s dark areas. In this case how to read the rapture of Elijah in 2Ki2? How to understand the gifts promised in Mark 16 and their significance to baptism? Or what about the wider theme of apocalypse as found in Daniel 7, the omitted psalms, and 2Ki? As if often the case with the 1928, the book remains fairly orthodox, but a watering down process is yet detectable. Ascension Day not only culminates in the Kingship of Christ, but implicit with His heavenly enthronement is a promise for the church to be given the authority and power cast away evil and subdue in His Name. This latter half does not come out as clearly in the 1928 as it does with the 1892/1662 versions for Ascension. The positive is the 1928 annexes an Eve and Octave to the day. A very good exposition on the Ascension of our Lord that uses 2 Kings 2 can be read here. Charles Bartlett lives and works in Northern California. He is a member-at-large in the UECNA, worshiping in the REC by bishopric dispensation. His blog, Anglican Rose, explores the nature of adiaphora in England’s Church with an emphasis on late-Henrician standards. A very thoughtful post, Charles. The notion of comparing lectionaries is an ambitious one and I hope that you continue to do this for the Feasts. An interesting project. I once thought of something similiar but decided that I did not have the time. I look forward to your future posts. Yes, it’s very challenging, and, at best, I can do something of ‘lay quality’. But this is probably why evaluations on lectionary revisions are lacking. It’s easy to bite off too much, and I have no plans to cover every holy day and sunday. However, reducing the comparison across BCP revisions is certainly made easier if we limit the question to those Holy Days given in the Table of Feasts, p. l (L) of the 1928 prayer book. That’s a pretty manageable sample of 36 to 40 days. Sundays could be added. But because the 1928 renews the ecclesiastical year vs. earlier versions that left weekday readings to in sequentia, you there’s nothing to compare the 1928 weekdays with. That said, it seems the 1928 restores octaves w/ the introduction of “-tides”. If this is the case, Ps. 108, 93, 96, reappear on the Sunday after Ascension for MP/EP as does the 2 Ki reading for Thursday which is the Octave, but this is still a marginalization of the 2Ki, imo. The remainder of the “-tide” appears to follow the typical in sequentia with respect to readings. The Sunday after Ascension readings for the communion, however, are more expressly anticipating Pentecost, not elaborating upon the Ascension theme of rapture and heavenly enthronement.